Get ready, Philadelphia—we’re welcoming in the Year of the Pig with a big celebration at the Rail Park on February 9 from 12-4 pm! 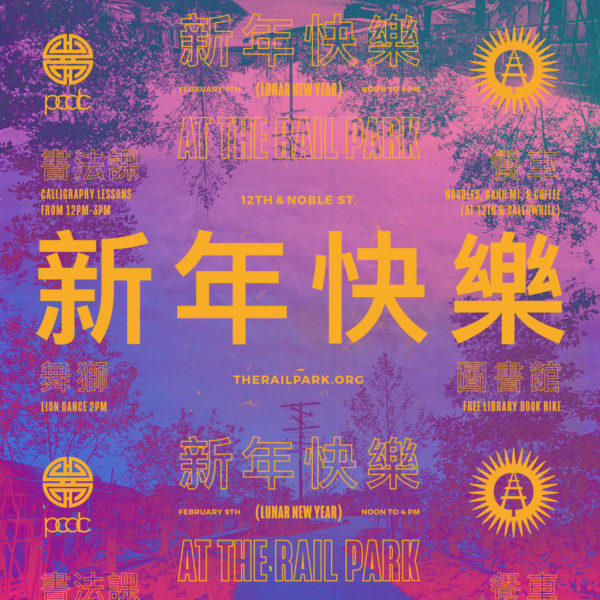 In collaboration with Philadelphia Chinatown Development Corporation, the Friends of the Rail Park invite you to enjoy an afternoon of food and cultural activities for all ages that celebrate the diversity of what our communities have to offer. Entrance is free. ☼ PLUS the Free Library of Philadelphia is bringing out their mobile Book Bike which will have books in English & Chinese for children and adults. Learn about Chinese New Year, calligraphy, and more! Wondering how to get to the park? There is an ADA-accessible entrance at 1300 Noble St (get there by directing your GPS to 12th & Noble and walk west), plus more fun activities at the lots just below the park at 12th St & Callowhill St. The park is just a 5 minute walk from the SEPTA BSL Spring Garden Station or ride a bike (racks and Indego dock available).